Many novels have tried to capture the fear and desperation that someone feels when there’s a mass shooting, and they also explore why - because how on earth can we make any sort of sense in such a senseless act of violence. 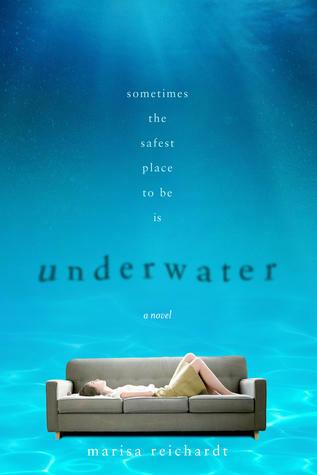 But Marisa Reichardt’s novel Underwater is different. She doesn’t ask why, and she doesn’t focus on the act itself, instead to looks at the aftermath – the emotional toll that it takes on the young survivors, and the people who love them. It’s a novel so moving you’ll be brought to tears, feel the panic tightening in your chest, and sigh in relieve as it passes. Newbery Honor medalist Jack Gantos is no stranger to writing. He’s been writing since he was child, and as an adult, has engaged readers of all ages with his fictional books and novels. But in 2002 he penned a different story – the story of his life. His memoir Hole in My Life recounts his nail biting, heart breaking, and harrowing journey of smuggling hundreds of pounds of hash from the Virgin Islands to New York City, and his subsequent incarceration in a federal prison. Jandy Nelson’s debut novel, The Sky Is Everywhere reduced its readers to tears and captured their minds with its beautiful language. Since then, readers have been eagerly awaiting her new novel, I’ll Give You the Sun - and they won’t be disappointed; it’s just as stunning. Albany, NY – In her amazing debut young adult novel "the sky is everywhere", Jandy Nelson writes about death, love & the hardships of growing up. For 17 year old Mia, life can’t be the same, as her spirit is hanging in limbo after her family’s car crashes, leaving her the only potential survivor. So begins Gale Forman's young adult novel If I Stay. Throughout the novel, and now the movie being released this Friday (8/22), we’re brought into a world no one should ever have to face – to choose to live or die - and we follow Mia as she makes this hard decision while in a coma. For the last decade John Green’s novels have engrossed readers as he explore the human condition, and wasn’t afraid to expose the raw feelings that make us who we are, and how we’re connected to those around us. His last novel, The Fault in Our Stars, was an instant success, and was subsequently made into a movie, that also tugged at the heart strings of everyone who read and watched it.